CSS Frameworks have gained wide popularity over time and the most commonly used frameworks are the YUI Grids that are a part of the Yahoo User Interface Library namely the 960 Grid System, Yet Another Multicolumn Layout ( YAML CSS Framework ) and the Yahoo Blueprint. Despite the fact that these CSS Frameworks have several things in common but again there are major differences too. If you consider the grid based CSS Frameworks namely the 960 Grid System, Blueprint and YUI they are considered to be the base blocks for creating an eye-catching layout inside a particular grid within seconds. These grids are easy to be comprehended as they simulate the table behavior however regardless of the fact they challenge the standard CSS principles such as the parting of layout and content. Talking about YAML it lays emphasis on building professional and individual layouts that make use of the standard CSS principles and the best in class practices. YAML is the only CSS framework which lets you choose amongst the different layout types such as Fixed, Liquid and Elastic and various measurements such as px and %em. YAML provides you more usability , accessibility, flexibility and Mobile Support when compared to YUI Grids. This is a slim framework core with 5.9 Kilobytes well prepared for HTML5 and CSS3. This framework is focused on various web standards providing supreme level of accessibility. It has matched building blocks for quick prototyping. This framework is built on SASS and has a bulletproof flexible grid system. With theme support and flexible forms this CSS Framework is just an ideal choice. It supports Name spacing that avoids conflicts with various other third party CSS. This framework was released in the year 2005 , October and has turned out to be a good base for creating flexible layouts with a powerful impact on dealing with the challenges which are a result of working with flexible fluid and elastic containers with differentiating units. As time has passed by several enhancements and extensions have been made to this framework with time depending on the requirements of the frontend developers and the feedback provided by its users. The code base of this CSS Framework is highly stable under all the real world conditions on almost all the websites. There are several websites which have won various awards at the annual accessibility competition in Germany. The main focus of YAML is on the device independence of screen design thus rendering bullet proof modules for flexible layout. 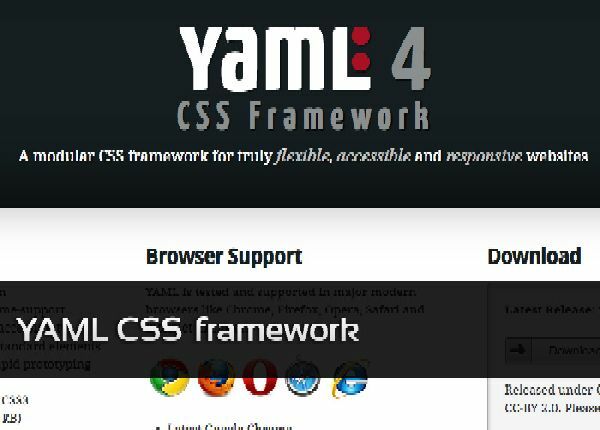 YAML is the CSS Framework to answer responsive design and is a great starting point for web development. It is a stable and versatile CSS framework that is often enhanced and updated along with several integration tutorials and templates for various CMS’s with ease of use. You can take the full advantage of all the best in class and novel web technologies as all layout modules are completely prepared from CSS3 and HTML5.